The International Space Station is undergoing an engineering analysis and risk assessment to gauge its ability to keep operating until 2020 and beyond. 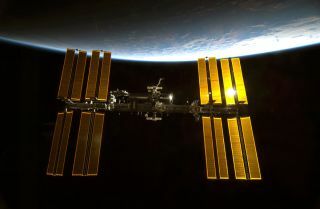 President Barack Obama’s National Space Policy, released in June 2010, called for, among other things, the continued operation of the International Space Station (ISS) by NASA in cooperation with its international partners, "likely to 2020 or beyond." "The good news is, so far, we haven’t found any showstoppers," said Brad Cothran, Boeing’s vehicle director for ISS. "Our plan has been to get back to the ISS program and clear the station to get to 2020," Cothran told SPACE.com. "After we get to that point, we’ll enter what we call our phase three, and we’re going to clear the ISS for 2028 and beyond," he said. As NASA's prime contractor for the ISS, Boeing is responsible for design, development, construction and integration of the orbiting lab. The firm also assists NASA in operating the space station. Boeing built all of the major U.S. elements and is responsible for integrating the systems, procedures and components of participating countries in the worldwide enterprise. Cothran said there are several categories defined to pull together an overall, integrated health check of the ISS, from a primary structure standing. The categories are: issues that could cause catastrophic failures; function availability; and how the shelf life of items can impact the ISS’ sustainability. "We’ve spent many years of analyzing all the primary structures," specifically the dynamic loads the ISS experiences as it circuits the Earth, Cothran said. "One of the key interfaces that we were worried about is all those modules hanging off the ISS truss. From a structural standpoint, that interface is critical, and the good news is that we have cleared that area and the attach points," Cothran said. Russia’s Zarya FGB, the first ISS module that was launched into orbit back in November 1998, has been cleared to at least 2020, Cothran said. That first-up hardware was U.S.-bankrolled, built by the Khrunichev State Research and Production Space Center in Moscow under a subcontract to The Boeing Co. for NASA. As far as what could cause a catastrophic failure, Cothran said that the analysis zeroed in on the space station’s high-pressure oxygen lines. "They were one of the biggest worries," he said. "We looked at pressures today and the number of cycles those lines have been through," Cothran said, adding that a team green-lighted the lines for a much longer life than they were originally designed for. In the area of functional ability, it turns out that the ISS' solar arrays are degrading at a faster rate than originally planned — between 1 and 2 percent per year rather than 1 percent. Inside and out, the sprawling International Space Station is being evaluated for its ability to sail to 2020 and beyond. "We’re seeing a very linear degradation across the entire fleet" of solar arrays, Cothran said. But why this is happening remains a mystery. It’s not yet confirmed, but one data point from a satellite in an ISS-like orbit and similar altitude suggests that the proton and neutron environment is more severe than thought, Cothran said. The good news is that the issue shouldn't affect the orbiting lab's operations for some time to come. "We’re not going to run out of power until well past 10 years from now," Cothran said. "It’s going to be somewhere within 2028, plus or minus five years." Ideally, by spotting this as an early issue, solutions like making electronics more efficient, reducing power consumption or putting some additional generation capability on the ISS can be considered, Cothran said. Replacing an entire solar array "is a very big deal and something we don’t want to go do," he added. Yet another finding concerns the shelf life of memory devices within electronics. Surprisingly, the ISS is suffering from a case of electronic memory loss. Erasable, programmable read-only memory devices — also known as "e-proms" — do not hold their charge after about 10 years. "They lose their state of internal charge….their internal memory. It’s an interesting find that we’ve run across. So we’ve got a plan now to go refresh those memory devices," Cothran said. That adds up to redesign of computers to be more efficient, as well as to get rid of obsolescence, he said. Another lesson learned in building and running the ISS is the role of lubricants. "We were very against grease-based lubricants external in the vacuum environment," Cothran said. "Nobody had any data early on about grease in a vacuum environment for an extended period of time. So everybody was against it from a material standpoint," Cothran said. That has come back to bite the ISS program somewhat, but fixes are on the horizon, he added. While there has long been concern about space junk potentially damaging the ISS, researchers have also found that the orbiting complex is subject to be dinged by its own detritus. "We are shedding in orbit … mostly paints, coatings," with the thermal coating as the most prevalent, Cothran said. "As we come back around [in Earth orbit] the next time or two or three or four weeks later, whatever, we’re hitting our own debris trail." The Boeing assessment is not quite complete. But it's already apparent that the ISS has been quite an engineering success, Cothran said. "The station has been remarkable if you look at how it’s flying today and the number of failures we’ve had," he said. "It’s totally surpassed any design requirements." Many lessons were learned in the building, operation and maintenance of the ISS. "It’s an incredible facility," Cothran said. "We learned how to put things together in space on ISS." He said those lessons can be applied toward establishing a crewed facility in the Earth-moon system, or toward the assembly of a spaceship that would take astronauts to Mars. "The nation and NASA are very fortunate that it has been the kind of station that it has been," Cothran said.